We feel one of the most important purchase of any office conference furniture is office chairs. Discount Office Furniture 4 U offers office seating that has been reviewed for both quality and comfort. Choose from a variety of ergonomic task chairs, executive chairs, conference office chairs and guest chairs, at discounted prices. Discount Office Furniture 4 U offers a one stop online office furniture shop for all your office furniture and home office furniture needs. We are committed to providing you with the best in quality and pricing on office chairs, desks, credenzas, conference room tables, reception furniture, filing and more. Our 30 years of office furniture experience helps you to make the best office furniture choices, with the ease of free shipping. 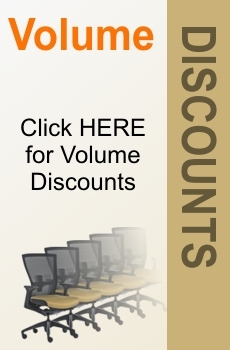 We understand that you are looking for the best possible pricing on your office furniture. Whether you are purchasing chairs, desks, files, conference room tables, or any other products we offer, our policy is to meet or beat any advertised price from an authorized dealer. It is our goal to provide you with affordable office furniture including discount conference tables, chairs, desks and files without sacrificing quality. All of our cheap conference tables, reception furniture, office chairs, desks and credenzas are offered to you with free and fast shipping, anywhere in the continental United States. If you require set up and installation, please contact us for additional information.